Paul Dresselhaus, Millie's son, reflects on his childhood and what it was like to grow up in Millie's house. Thank you all for coming. Thank you, Gene. Thank you, MIT, for putting this on. And mostly, thank you, Marianne, for being the adult in our family and arranging everything. I wanted to say a couple words about what it was like to grow up in Millie’s house, and this is mainly an excuse to have a slide show. I need to give some credits, here, for my photography: mainly to Shoshi Cooper, who went through all the family pictures and digitized them; and to Gene, for taking so many pictures when we were growing up. First, I want to explain what I’m going to talk about, with you, today. You can call it an outline. I’m going to talk, a little bit, about people who let Millie be Millie. I’m going to talk about some of the opportunities we had, as children, to see the world alongside Millie, because those were really interesting and special. And, finally, I’m going to talk about some of Millie's passions. This is now a somewhat famous picture, since it appears in the program. Here, you can see Millie and her parents and the family, all crammed together onto a couch. That's me, on Gene's lap. Millie is holding Eliot — I think he’s about two. Millie and Gene as newlyweds, in California. Photo credit: Dresselhaus family. Let’s talk, a little, about people who let Millie be Millie. The first person who we need to talk about, of course, is Gene. Millie and Gene at Iguacu. Photo credit: Dresselhaus family. Millie and Gene at the Heinz Award. As we said before, he’s been a lifelong partner, co-author, collaborator, and a great father. He supported the family and was with us while Millie was doing other things, and — he was just a great dad. He made a great family. I used to tell people that I was the son of a paradox (pair of docs), and I think that's true, in many ways. 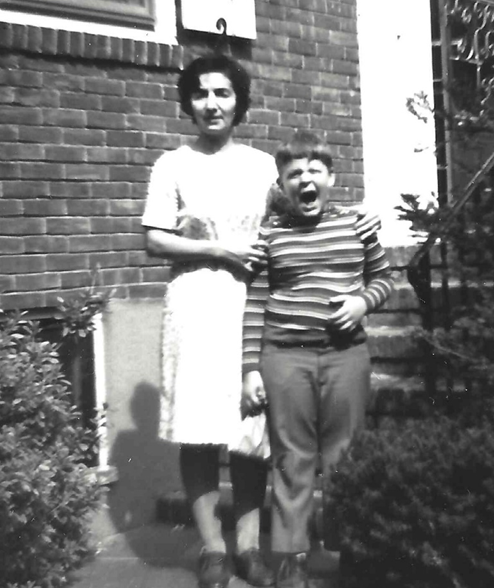 Dorothy Terzian and Eliot. Photo credit: Paul Dresselhaus. Let’s talk about another person who really allowed Millie to be Millie, but who was kind of behind-the-scenes and who most people don't really know about. Her name is Dorothy Terzian. Mrs. Terzian came to work for Millie, and her job was to take care of the children and the family. I think she started working in 1961 or '62. I wasn't alive, then, so I don't remember the exact date. But she had her own set of children, and they were growing up and moving on. So Millie took her on, to take care of the Dresselhaus children, and so, Mrs. Terzian was always there, when we were very young — taking care of us, changing our diapers, etc. She was always there, when we came home from school. She worked for Millie for 30 years or so, until long after we were out of the house. She was a very important member of our family. Here's a picture of her at my wedding, in 1993, just to show that she really was a very important member of the Millie operation. And she helped Millie to be Millie. Let’s talk about trips with Millie. Millie had no problem taking four small children around the world, with her. This is in Brazil in 1971, which means Eliot would be six, here. Imagine the four of us traveling, for a couple of months, halfway around the world. We were not well behaved children, so I'm not exactly sure how she did it. But you know the way Millie is. She just did it. She didn't accept the impossibility of traveling around the world. And then, the people would say, “Uh… uh… okay.” Because they wanted Millie. The Dresselhaus family in Japan. Photos property of the Dresselhaus family. We went to Japan, in 1973. We were there for a couple of months. We learned baseball, in Japan. Do you remember learning baseball in Japan, Eliot? It’s a funny thing to think about: a bunch of American boys who never really knew baseball, until we went to Japan. And then we had a trip to Venezuela, in 1977, to visit Mario and his clan, while he was at IVIC (Venezuelan Institute for Scientific Research). That was a wonderful trip. You can see Mario and me, in the photo, both with the frizzy hair we had back then. Another one of Millie's great passions was walking. 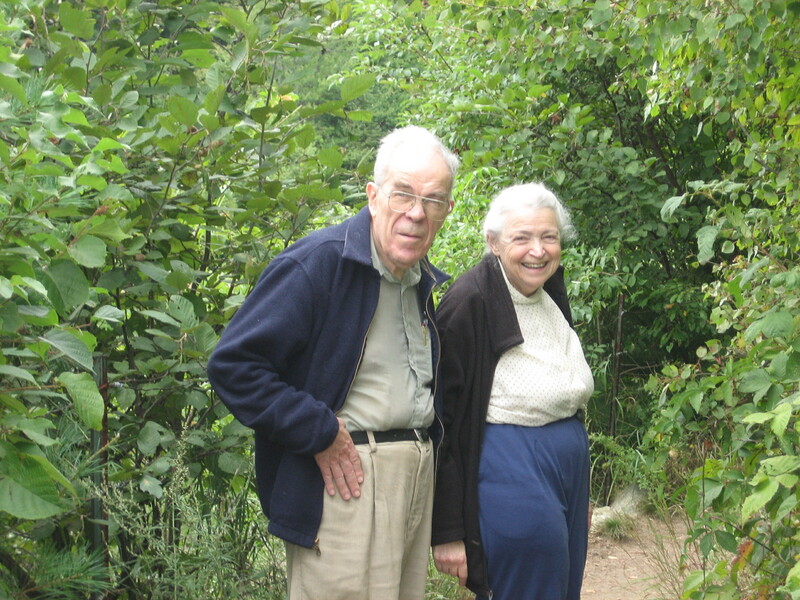 I'm sure many of you walked around MIT, with her, in her later years, when she wasn't really much into hiking, anymore — but she still loved to walk and get around. Up until the last month or so, she would walk around the pond near our house, whenever she could get a chance. There is a picture of her hiking with Gene in the Sierras for their honeymoon. So you can see, this passion of hers started early. This picture looks like it’s probably Mount Monadnock, one of our favorite hikes in New Hampshire. This is a picture at Mount Whitney, taken with Gene’s brother, Carl — there are lot of people named Carl, in our family. You can see Millie in back, and I'm right in front of her, hiding behind the sign, I think. We used to give the really fast hikers, in our family, the heaviest backpacks, in the hopes that would slow them down. It didn’t. 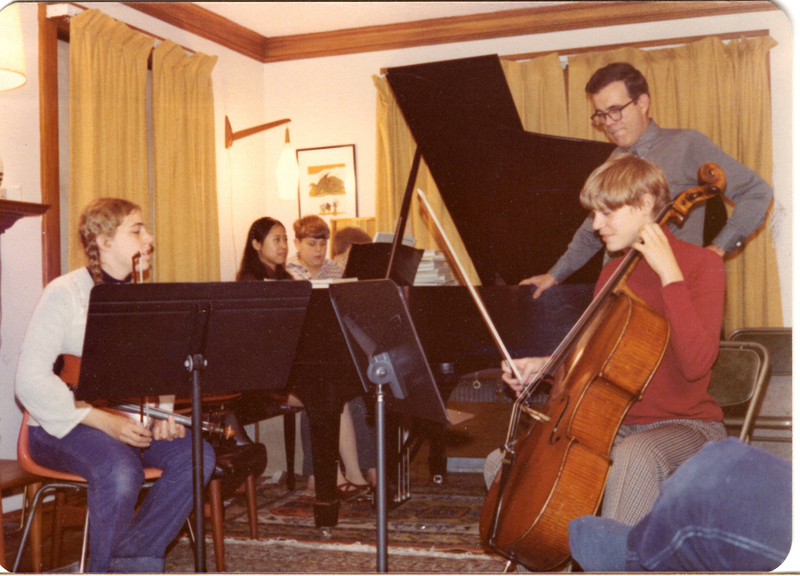 The Dresselhaus family puts on a concert on Thanksgiving Day. Photo credit: Millie Dresselhaus. And, of course, all of you know Millie's great passion for music. Millie not only loved to play music, but it was also very important, to her, that her kids learned to play music. Millie helps Paul practice violin. Photo credit: Gene Dresselhaus. So, in this picture, she's teaching me or, possibly, correcting my bowing. I'm not sure, exactly. But it was very important, to her, that we learn to play chamber music. She taught me how to fake chamber music. This is a skill that I highly recommend, because it's so much fun, and you don't need to be very good! Millie played with famous people, she played with infamous people, she played with anybody. She had so much fun playing music. Millie’s students at a party at her home in Arlington. Also, Paul and Gene at the same party. Photo credit: Marianne Dresselhaus Cooper. I think another great passion of Millie’s was her students. These are just a couple of pictures that we have of students coming to our house for parties. Millie’s students at a party at her home in Arlington. Photo credit: Marianne Dresselhaus Cooper. I remember Jim Tsang and his suckling pig, and Dave Cammack with his beer stew, and all the grad students and postdocs who would come around. It was just a wonderful community of students and academics and family, because all of those categories mixed together for Millie. 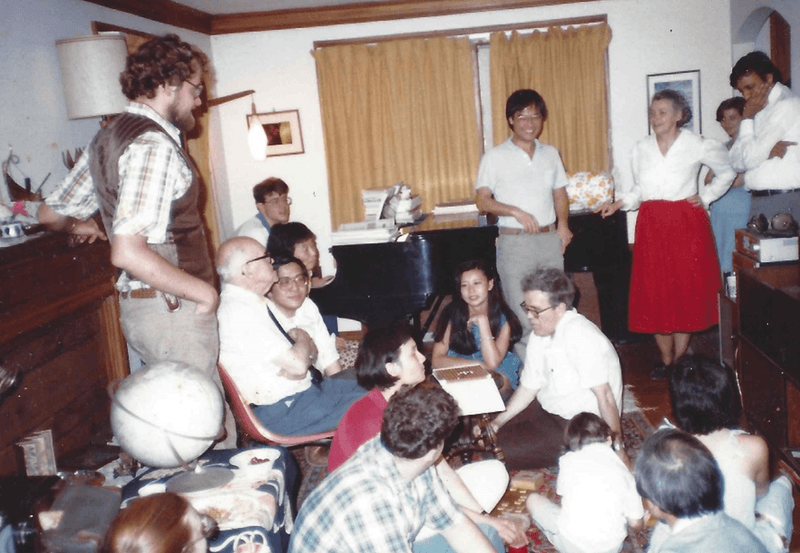 It was family and students and science — it was all one great, big hodgepodge. Millie, her father, Gene, and Eliot help to entertain a group of students visiting Millie’s house. I think that's all I have to say. It was a good childhood, and I enjoyed it. And, you know, we all thought it was pretty normal, living through it. But I guess maybe it wasn’t exactly as normal as we all thought. The next speaker is going to be Dennis Buss. Dennis Buss was a very early student of Millie's. He went on to a great career at TI, MIT, Analog Devices, and now, he's back. One thing I have to say about Dennis is that he was a childhood hero of mine — not necessarily because he was so smart and well-spoken and kind, but because he raced the Cog Railway up Mount Washington. You didn't say who won!